Fort Arbuckle (1851-1870) - Established on 19 Apr 1851 by Captain Randolph B. Marcy (Cullum 690) and Company D of the 5th U.S. Infantry in the unsettled Indian Territory and named for General Matthew Arbuckle. General Arbuckle was the Commander of the Military Department of Missouri until his death from cholera on 11 Apr 1851 at Fort Smith (2). Fort Arbuckle was abandoned in 1870. Fort Arbuckle's purpose was to protect the Civilized Indians, Chickasaws and Choctaws, from the Kiowa and Comanche Indians and to protect the wagon train emigrants making their way to the California gold fields using the trails between Fort Smith and Santa Fe. The post originally measured 12 miles by 12 miles but it was reduced in size to 9 miles by 12 miles at the request of the Chickasaw government. The buildings of the fort itself were erected in the shape of a rectangle, a line of barracks on either side, with commissary and quartermaster's quarters at one end, and the officers' quarters at the other. Outside of the rectangle there was another long one-story building, suitably divided, and used as dispensary and steward's room, hospital, and kitchen. One hundred yards north of the commissary was the sutler's store. The houses were all well built of hewn logs, chinked with wood and clay, and had stone chimneys. Lt. George B. McClellan served at Fort Arbuckle in the early 1850's and later married Mary Ellen Marcy, one of Capt. Randolph B. Marcy's daughters. George and Mary Ellen were married in New York City on May 22, 1860. McClellan later served as the Commander of the Army of the Potomac during the Civil War with Marcy as his Chief of Staff. Over the years, Fort Arbuckle was occupied by the U.S. Army, Confederate troops including the Chickasaw Brigade during the Civil War, then reoccupied by the U.S. Army's 10th U.S. Cavalry or "Buffalo Soldiers". 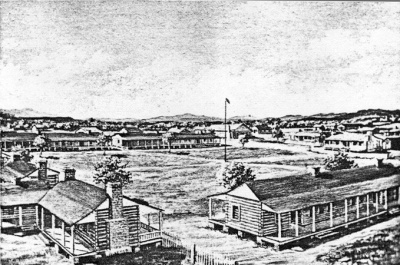 The troops from Fort Arbuckle were transferred to Fort Sill (1) when it was established. The fort was finally abandoned in the early spring of 1870. The cemetery was moved to Fort Gibson National Cemetery. Part of a chimney from the officer's quarters is the only remaining part of the fort still on the site. Location: Seven miles west of Davis on the south-side of Wild Horse Creek, Garvin County, Oklahoma. This page has been accessed 10,577 times. This page was last modified 04:28, 16 April 2019 by Bill Thayer. Based on work by John Stanton.